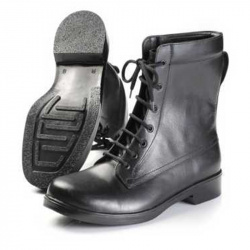 The traditional supplier of RAF Flight boots since 1943, the Haynes and Cann 65 Pilot boot was used on all aircraft platforms, and is available again. The Type 65 were designed for flight crew, and to allow them to fly an aircraft in comfort, and without any points that might catch in the cockpit or exiting quickly from the cockpit. The boots were also remownd for their comfort. The boots themselves reduced the fatigue associated with long flights in enclosed spaces and helped to correct poor foot position.